Microcontrollers — those integrated circuits that act like small computers — have come a long way in the past few years. There are the Arduino-styled microcontroller and its clones. The devices are firmware based, meaning that you code your program then upload it to an electronically erasable programmable read-only memory (EEPROM) on the chip. It’s fast and runs the uploaded program upon power up. The module reads some inputs, performs some calculations and sets some outputs. Other commonly used microcontrollers include the PIC and MSP430. The other major type of off-the-shelf microcontroller is the single board computer (SBC). These boards are usually based on 32-bit processors, have large memories, an operating system and can be programmed in a variety of languages. The Raspberry Pi, BeagleBone and CHIP computer fall into this category. They universally run some form of Linux. Some can even function as basic desktop computers. There are a ton of inexpensive, off-the-shelf SBCs out there. Today I’d like to concentrate on the near-term-trends that you can leverage in your projects. Boards like the Raspberry Pi and its clones have the operating system and all its data on a nano-SD card. This makes changing the project’s behavior as simple as swapping in a different card with your favorite operating system image and applications. A recent trend is to put the operating system in FLASH memory. The Beagle Bone and CHIP boards use this method of storage. They come pre-loaded with Linux. Plug them in and they’re ready to go. You can use various tools, like “apt-get” to update to the latest versions, add applications and so on. If you don’t want to bother with nano-SD card images, give one of these FLASH based boards a try. They boot quickly, are full-featured and reliable. Onboard WiFi is the hot ticket to wireless connectivity on the Pi, BeagleBone and CHIP. All three have versions of the board with WiFi. Usually a Bluetooth radio is also included for local connections to headphones, keyboard/mousepads and other short range gadgets. NotEnoughTech did some speed tests on the built-in Raspberry Pi WiFi radio. The results certainly aren’t scorching. Keep in mind that wearables and DIY projects typically don’t have huge data throughput requirements, like video streams. I think WiFi will be pretty standard across most SBCs in the future as the industry ramps up it’s use of artificial intelligence (AI) and augmented reality (AR). That doesn’t mean that the non-WiFi equipped boards will disappear. Any radio that you stick onto a board, whether WiFi, cellular, Bluetooth or whatever uses power. Low power projects may not need any connectivity, so why not use a board without radios. The cost would be lower as well. Lot’s of people are discovering the wonders of “headless” projects. Headless simply means that your gadget doesn’t have a monitor. Usually a monitor is hooked up to the HDMI port or a small TFT LCD display that’s connected to the microcontroller’s digital input/output pins. Without a monitor, you can do automated jobs, like acting as a network storage device or an MQTT server. The Mosquitto under Glass project was headless and shuffled MQTT messages back and forth between client devices. Typically you either temporarily attach a monitor to write programs or log in remotely from another machine using SSH. Once you get used to remote login, over the network, this style of work is pretty straightforward and useful. Running a project headless also lets you operate and update a gadget that’s hard to access. Your device might be on the top of a building or buried in some shipping container. There’s no way to use a monitor, so logging in remotely, to a headless microcontroller is the only way possible. A great page for keeping up with the latest microcontrollers is LinuxGizmos. FLASH-based, WiFi-equipped, headless microcontrollers are becoming common and can make your projects smaller and more convenient. The technology will continue to mature. Be on the lookout for new ways to leverage all the cool capabilities coming down the road. 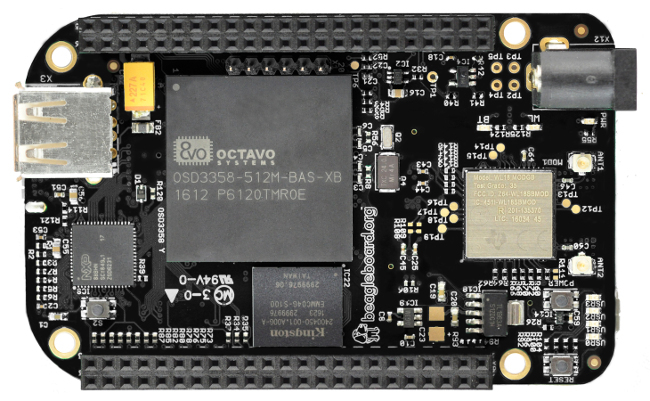 Feature image: The BeagleBone Black Wireless.